2018 is quickly coming to a close and looking back there is quite a lot for DFINITY supporters to be excited about. In a Medium post earlier this month, Dominic Williams, President & Chief Scientist of DFINITY, gave an update on the development of the network. 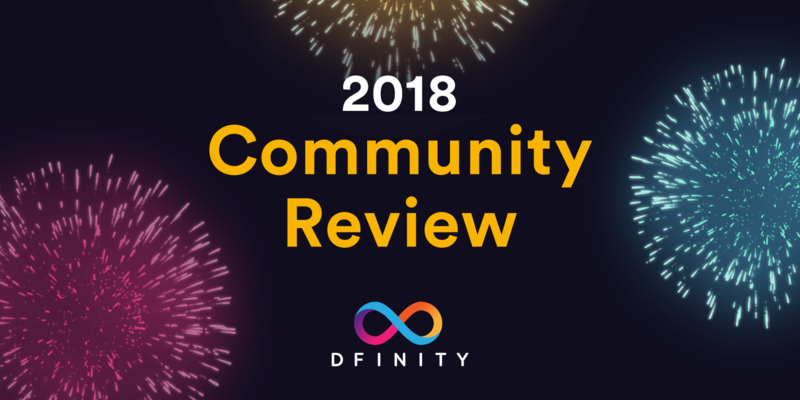 So as we prepare to say good bye to 2018, we’re sharing some of the many things that have happened this year for the DFINITY team and community. We hope you enjoy and thank you for your support throughout the year! We kicked off the year with the release of our first white paper on consensus. The origins of the DFINITY consensus mechanism date back to 2014 when Dominic Williams started to look for more efficient methods to drive consensus in large networks. Since then, a significant amount of research has driven into the protocol over several iterations to reach its current design. You can find the DFINITY white paper and other technical resources on our website. In the video below from BPASE 2018, Timo Hanke, Chief Research Officer, and Mahnush Mohavedi, Senior Engineer & Research Scientist, present on DFINITY’s consensus mechanism. We’ve seen the creation of new community channels and have been introduced to new faces around the world. 2018 has been full of surprises for all of us on the community team. What has been especially great to see is the amount of support that has manifested in the growth of our community channels. 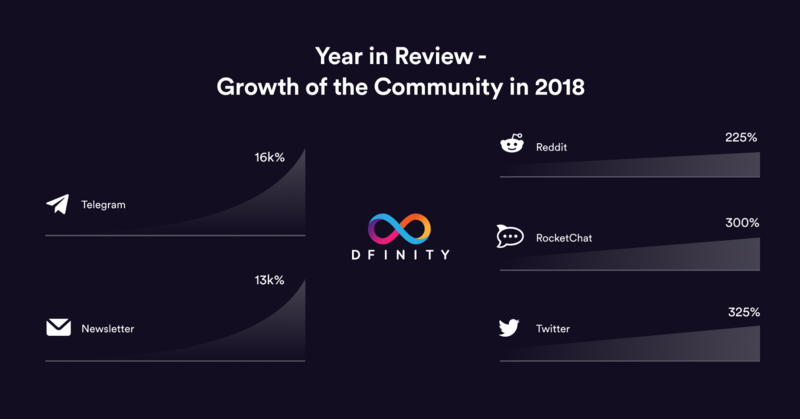 This wouldn’t have been possible without the dozens of community members who have stepped forward to volunteer time and talent in making our community channels a better place to interact and learn more about DFINITY. We shared the DFINITY vision at meetups and events across the world. With the help of our community, the DFINITY team was able to make a number of appearances at meetups and events. Over the year, we’ve hosted over 60 meetups in 35 cities. We’re excited to visit the community in more places in 2019 and share the DFINITY vision. Interested parties can find some of the presentation from this year at the DFINITY Youtube channel. Below, we’ve shared some of our favorite recorded presentations from this year. We’ve continued efforts to create a NASA for decentralization. 2018 has also brought many new faces to the DFINITY team. Andreas Rossberg, Senior Staff Engineer & Researcher and co-designer of WebAssembly, Dr. Jan Camenisch, Head of Privacy & Cryptography, Mack McCauley, Vice President of Engineering, Judy Piper, Director of Engineering, and more chose to lend their talents to bring the DFINITY vision to life. 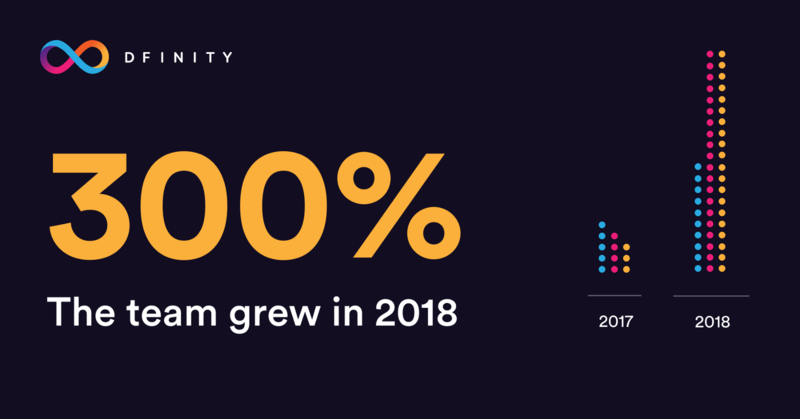 At DFINITY, we believe that it is an imperative to share information about the growth and evolution of the team. Giving the community a better look at the people behind DFINITY is one way we intend to establish accountability for those that are interested in building upon the DFINITY network. In the following graphics, community members can learn a bit more about the educational backgrounds of current team members and the places around the world they call home. 2018 was also an exciting year for DFINITY expansion. In October of this year, we announced the opening of the DFINITY Research Center in Zurich, Switzerland which is led by Dr. Jan Camenisch, an IEEE Fellow and multi-award winning research scientist famous in the fields of cryptography and privacy. Research focused teams at DFINITY continue to do great work to push the industry forward in areas such as cryptography, privacy and networking. In 2018 alone, over 30 peer reviewed papers have been published by DFINITY team members. We gave the community a look Inside DFINITY. Another key resource for community members on the people and technology behind DFINITY is our video series Inside DFINITY. This series was announced earlier this year and features interviews with different team members across the organization as well as technical discussions on industry topics such as key differences between Ethereum and DFINITY, blockchain properties, and attack vectors. In the video below, DFINITY’s Cédric Waldburger sits down with Dominic Williams to discuss the inception of the project. We’ve continued efforts to support academia. 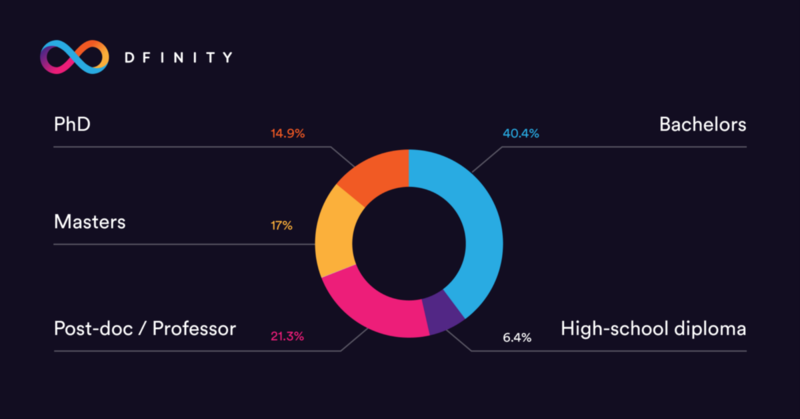 For the DFINITY team, it is important that we continue to support students and universities progressing the study of disciplines integral to DFINITY’s technology including distributed computing, cryptography, and decentralized systems, among others. This year we announced a partnership with the Stanford Center for Blockchain Research and will continue to support their efforts which will ultimately push the collective industry forward. 2018 was also the first year in which we offered a scholarship opportunity to students who significantly contributed to the field of secure distributed systems. We announced the winners of the 2018 scholarship and their research proposals earlier this year. You can learn more about the promising work being done by these scholarship recipients in the special Inside DFINITY video below. We dreamed up fun ways to thank the community for their support. We’re constantly thinking up new ways to show our gratitude for the support and enthusiasm by the community for the DFINITY project. 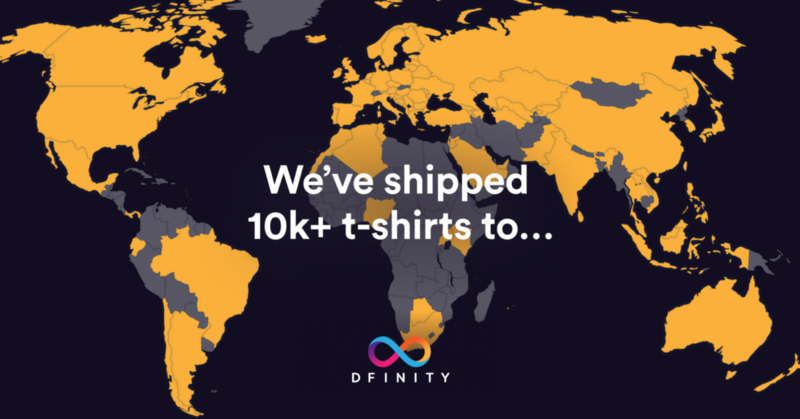 This year, we said thank you by shipping thousands of DFINITY t-shirts to community members all over the world. In total, we shipped over 10,000 shirts to over 100 different countries. We look forward to finding new ways to show our gratitude in the future and sharing some fresh new designs for community t-shirts in 2019! Finally, we’re saying farewell to 2018 with a new Inside DFINITY video with the Community team. 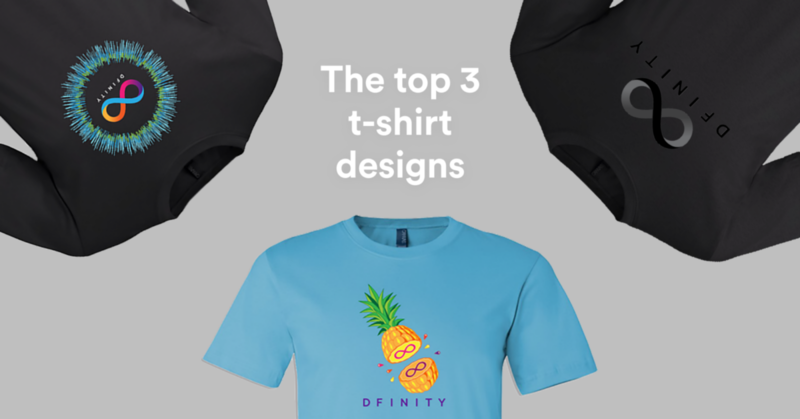 We recap some great memories from this year and dive into the work happening behind the scenes to support the DFINITY community. We’re excited to do even more in 2019. For all of us at DFINITY, the close of one year represents a reminder to push even harder in to the next. In addition to continued support for our existing initiatives, we’re looking forward to finding new ways to share the DFINITY vision and empower those who’d like to help make it happen. Stay tuned for future announcements on the progress of the project and how you can also get involved. In the meantime, you can connect with others interested in DFINITY by visiting our community page. See you all in 2019! Advocating for all things community at DFINITY.